If the Church was the spiritual center of the Castle, then the keep, 30 meters high, was its strategic center. From the upper platform, watch was kept for the enemy, and in the worst-case scenario, you could seek refuge in the tower. The dungeon is among the Castle’s oldest buildings. 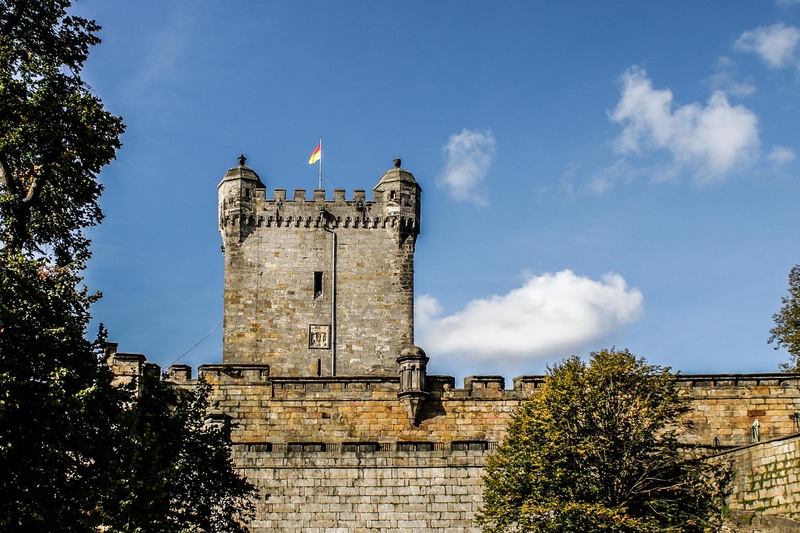 The core of the tower dates back to the time of the 11th to 12th century, receiving its present look during the time of Count Everwyn II at the beginning of the 16th century. The façades facing the courtyard and field bear the coats of arms of both Count Everwyn (1461-1530) and his consort, Duchess Ingeborg von Meklenburg respectively. If you look closely, you will discover a few cannonballs rammed into the walls, which stem from an attack in 1795. The Tower has a height of 30 meters and its basic measurements are 14 by 14 meters. The thickness of the walls at the base is 5.5 meters. In the Middle Ages one entered from the courtyard side about halfway up the tower using wooden ladders that could be pulled up, if needed. The entrance as it is today dates from more modern times. In the interior of the Tower you see a small opening in the floor, the hole of fear. It is the only entry to the windowless dungeon 12 meters below. In the Middle Ages, this was the Castle jail, serving later as the Gunpowder Magazine. Entrance to the dungeon was only accessible by means of a rope winch installed above the hole of fear. Here in the Tower, or respectively, later in the chamber above the gate, was where court was held for punishable crimes. Lesser court cases were tried by a low court, which customarily met underneath the lime tree (called the Judicial Lime) in front of the lower Castle gate. Ascending steep wooden stairs, you reach the upper floor of the Tower as well as the platform which, when the weather is clear, affords you a panoramic view over the surrounding landscape all the way to Lingen, Ibbenbüren, Gronau and Enschede. The turrets, attached at each of the four corners, were added in 1706. These are the Baroque successors of what were formerly small wooden shelters for the watchmen on the tower. Via the sentry walks we reach the royal stables.